Before attempting any movement practice, please follow the advice you have been given by your physician, physical therapist, or any health care professional about your range of motion, injuries, and physical limitations. Recognize that this is your practice. You must listen to your body and only work to your level of ability. If the practice feels like too much, please take breaks, modify the movements or just leave some of the movements out. Recognize that body and energy levels vary day-to-day, so just because you can do something one day, that doesn’t mean you will be able to do it the same way every day. Doing Mindful Movements is a time to practice respecting your limits and being kind and generous to yourself. As promised in my last post, Mindful Movements: Yes, you can be mindful even if you can’t sit still, this post sets out a short Mindful Movements practice. I have called it a 10-minute practice but you can make it longer or shorter, depending on how long you spend with each movement. Please note that many of these movements can be done seated, so you can do them in a chair if you need to be seated at work, have mobility issues or are just having a low-energy day. Taking a seated position in a chair, plant your feet on the floor, sit up tall and drop your chin toward your chest. If your shoulders try to creep up by your ears, just relax them down. Feel the stretch in your neck and between your shoulder blades. How far down your back can you feel it? When you are ready, gently rotate your right ear toward your right shoulder and then hold your head tipped toward the right, feeling the stretch along the left side of your neck. If your shoulders try to come up and meet your ears, just drop them down. When you are ready, drop your chin back down to your chest and then rotate your left ear toward the left shoulder, dropping the shoulders down away from the ears. Hold, feeling the stretch along the right side of the neck. Begin to slowly rotate the head from side to side, dropping the chin down toward the chest between sides. Note any areas where the movement is particularly smooth and anywhere it is a bit sticky. Bringing the shoulders up toward your ears, draw your shoulder blades together and then drop the shoulders back and down, opening up the chest. Continue to roll the shoulders slowly, really feeling every part of the movement. Notice where your shoulders move easily and where they may meet some resistance. When you are ready, switch directions. Notice any thoughts that arise. For example, you may notice that you like moving your shoulders in one direction better than the other. When thoughts arise, just note them and then return to the sensations of the movement. Notice where your shoulders move easily and where they may catch a bit. Notice the space that is created between the shoulder blades as the shoulders come forward. Notice when you tend to inhale and when you tend to exhale during the movement. Sit forward on your chair so that you have some space between your back and the back of the chair and grab ahold of your knees. As you inhale, draw the chest forward through your arms, arching the back, opening up the chest and looking up slightly. As you exhale, round the back, drop the chin toward the chest and let yourself hang back, feeling a stretch between the shoulder blades. Slowly begin to rock back and forth between these two postures, seeing if you can feel the movement start at the base of your spine and ripple up each part of the spine like a wave. Stand up and plant your feet firmly on the floor, hip distance apart. Align your body so that your knees are directly above your ankles; your hips are directly above your ankles, and your shoulders are directly above your hips. Draw the shoulder blades slightly together, opening up the chest. The chin is parallel to the floor. Press into your feet and feel how this action makes you grow a bit taller. Take a moment to close your ears or just soften your gaze and notice how it feels to stand tall and balanced. Gently rock forward onto your tiptoes. If that feels like too much, just shift the weight onto the balls of the feet. As you do so, notice how the whole front of your body engages to keep you balanced. Rock back onto the heels. As you do so, notice how your body automatically bends in the middle, your torso moves forward and the back part of your body engages to keep you balanced. Rock back and forth, experimenting with how far you can go. Notice any judgments that arise about your balance or what you “should” be able to do. No need to fight these thoughts. Just note them and return to the bodily sensations that accompany this movement. Seated Modification: Press your heels into the floor, drawing the rest of the foot up off of the floor. Bring the rest of the foot slowly down onto the floor and then press the toes into the floor, drawing the rest of the foot upward. Alternate rolling onto the heels and onto the toes, seeing if you can notice when each part of the foot touches the floor. Come back to being balanced over your feet. Now, rock a little over to the left and then back to the right and then gently sway back and forth. As you sway, see if you can notice at what point in the movement you reach a point of equilibrium and at what point the weight shifts onto the left or right foot. Notice at what point you reach an edge at which you can go no farther without tipping over (and if you pass that edge). Notice what sensations arise in your body as you approach and reach that edge. Making the movements smaller and smaller, gently come back to stillness and equilibrium and take a moment to stand tall, appreciating the sensation of being balanced. The next movement requires balance so you may wish to hold onto the wall or a chair. Sometimes even placing a finger on the wall or a chair is enough to steady you. Grounding your right foot firmly into the floor, lift the left foot slightly off the floor in front of the body. Rotate the left foot around the ankle, noticing any cracking sounds the ankle makes. Also, notice the micro-adjustments the standing leg makes to keep you balanced. Switch the direction of the ankle, noticing if any thoughts arise, such as liking one direction better than the other. When thoughts arise, simply return your attention to the bodily sensations. Now planting the left foot on the floor, lift the right foot and repeat the same movement on the other side. Seated Modification: Stretch the legs out in front of you, keeping your heels on the floor. Rotate your feet around the ankles one direction. Notice any cracking sounds the ankle makes. Switch the direction, noticing if any thoughts arise, such as liking one direction better than the other. When thoughts arise, simply return your attention to your bodily sensations that accompany this movement. Placing the two feet firmly on the floor, align your body again as you did in the “Standing Tall” practice above. Take a moment to notice all of the sensations in the body. Notice if there has been a shift in the sensations or your energy level between the beginning and the end of the practice. When you are ready, open the eyes if they have been closed. You can now carry on with your day, or if you choose, take a moment to engage in a seated mindfulness practice. Previous Mindful Movements: Yes, you can be mindful even if you can’t sit still. Unless otherwise noted, all photography and art on this site are the copyright property of Lynette Monteiro. Please do not use without permission. 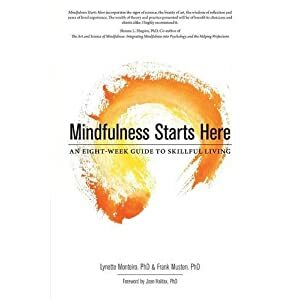 Ottawa Mindfulness Clinic by L.M. Monteiro & R.F. Musten is licensed under a Creative Commons Attribution-Noncommercial-No Derivative Works 2.5 Canada License.